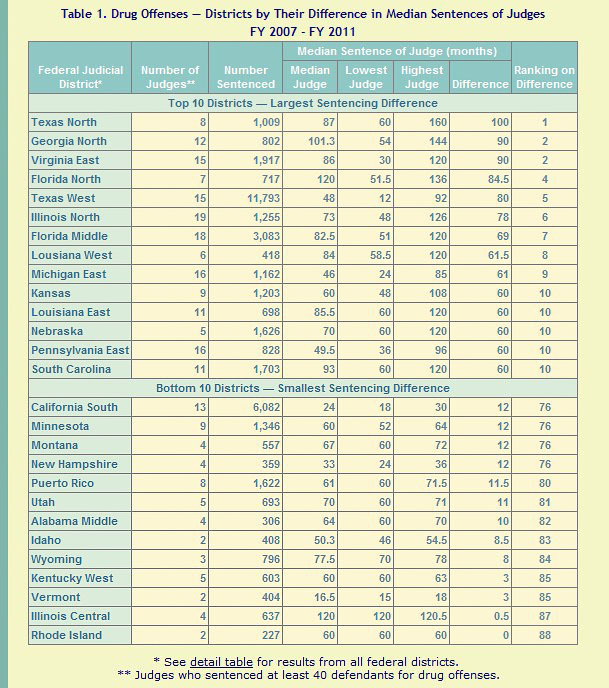 After analyzing 370,000 court cases, the Transactional Records Access Clearinghouse (TRAC) compiled a unique judge-by-judge and district-by-district comparison of federal sentences imposed for drugs, white collar and other kinds of crimes from FY 2007 to FY 2011. The interactive tool compares the typical sentences handed down for similar cases by other judges within same district. To smooth out the disparities, only judges who have sentenced 40 or more cases of a particular type were included in the statistics. The database is vulnerable to criticism in that it does not take into account many of the factors within each individual case. Nevertheless, some interesting patterns have emerged. For example, in the Eastern District of California (Bakersfield, Fresno, Sacramento, Redding) the most lenient judge’s median white collar sentence was 3.4 months, whereas the highest judge’s median sentence was 22 months. Lowest median drug sentence in the Southern District of California (San Diego) was 18 months, with the highest judge sentencing to 30 months median. This makes Southern District rank among the lowest in drug sentencing disparities in the nation.